Nothing but Winter around here, bitter cold last night! Plenty of sunshine today but still freezing. 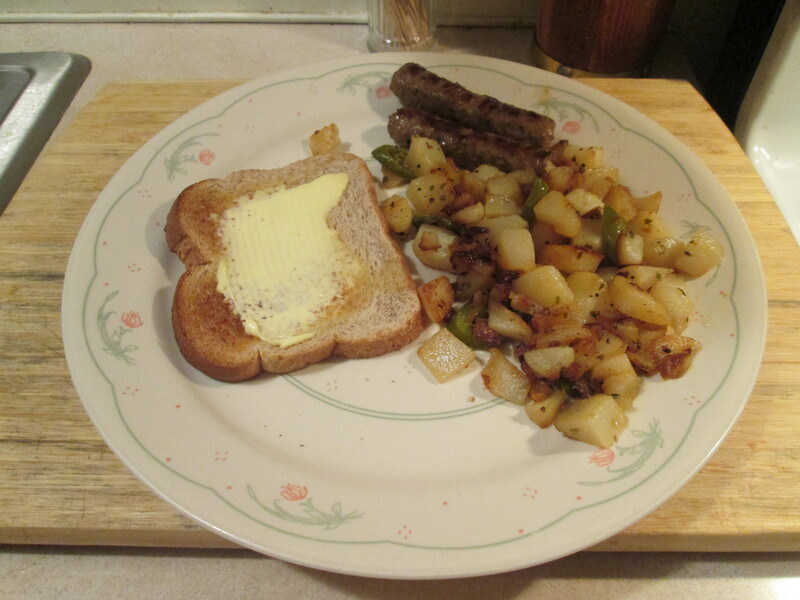 Started the day off by warming up the leftover Jalapeno Cheddar Fried Potatoes along with frying up a couple of Jennie – O Turkey Lean Breakfast Turkey Sausage Links. Also had a slice of Klosterman Wheat Bread ans a hot cup of Bigelow Decaf Green Tea. Good start to a Winter’s Day! Yesterday late afternoon Fed Ex dropped off a package for me and it was from Jennie – O Turkey. The box had free Jennie – O Turkey Products, 1 – 1 lb. 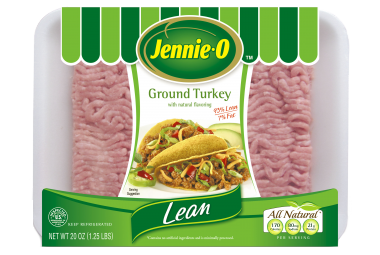 Package of Jennie – O Lean Ground Turkey, 1 – 1 lb. Roll of Jennie – O Lean Ground Turkey Breakfast Sausage, and a Sun-Dried Tomato Premium Portion Turkey Breast! The free samples Jennie – O Turkey sends me from time to time is from being part of their Switch Club. In return I give reviews of the products after I try them and pass those reviews and any recipes along to everyone, and since all their products are healthy and delicious it’s easy to review. It’s amazing the products they’ve sent me over the past year, so a Big Thank You to Jennie – O Turkey! For dinner tonight I prepared Turkey Burritos. 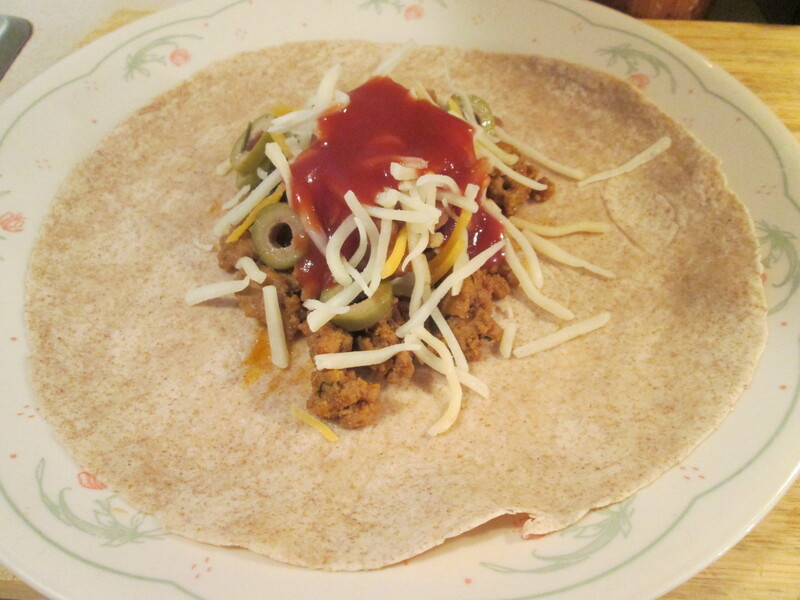 I used my free sample of Jennie – O Lean Ground Turkey for my Burritos tonight. along with the Ground Turkey I’ll need; 1 Package Old El Paso Less Sodium Taco Seasoning Mix, Sliced Green and Black Olives, 1 Can Bush’s Low Sodium Black Beans (Optional), Daisy Reduced Sour Cream, Sargento Reduced Fat Shredded Sharp Cheddar Cheese, Old El Paso Fat Free Refried Beans (Optional), Chopped Tomatoes (Optional), and OLE High Fiber Low Carb Tortilla Wraps, (10-inch), warmed. To prepare it; I started by frying the Ground Turkey till it was no longer pink in Extra Virgin Olive Oil and seasoning it with Sea Salt, Ground Roasted Cumin, Cilantro Flakes. As the Turkey was finishing cooking I added 1 package of Old El Paso Low Sodium Taco Seasoning and 3/4 cup Water, continued to cook and stir for an additional 6 minutes. Jennie -O and Old El Paso together make one fine Taco! To make the Burrito; Spoon the Turkey mixture into Tortillas. Add your toppings. Fold over bottom and sides of each tortilla and they’re ready! I love these! Easy to make and just flat-out delicious and filling. For dessert later a Del Monte No Sugar Added Peach Chunks Cup. 1 – Brown meat in large skillet on medium-high heat. Drain fat. 2 – Stir in Seasoning Mix, water and beans, if desired. 3 – Bring to boil. Reduce heat to low; simmer 5 to 10 minutes or until liquid is absorbed, stirring occasionally. Spoon into tortillas. Add desired toppings. Fold over bottom and sides of each tortilla to serve.